Tir Coed is working in partnership with Aberystwyth University to supervise a PhD project investigating the therapeutic potential of woodlands in enhancing health, well-being and social engagement within rural communities in Wales. The PhD project is funded by KESS 2, an initiative funded by European Social Funds to connect small to medium enterprises (SMEs) with postgraduate university students across Wales to enable collaboration on research projects which will benefit Wales in areas such as health, the digital economy, low carbon technology, and advance engineering. This project will work closely with Tir Coed volunteers to understand the ways in which woodland-based training and activities can influence their physical and mental health, well-being, and connection to their communities. By following volunteers’ experiences and progression over time, this project aims to provide Tir Coed with the evidence we need to continue developing our programme to best benefit rural communities in Wales. 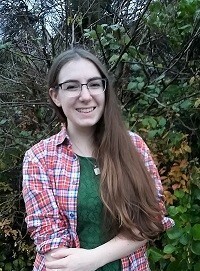 Eleri is Tir Coed's residential PhD student and it will be her job over the next few years will be to study and document the experiences of Tir Coed's participants as part of her analysis of Welsh woodlands and therapeutic sites which can enhance well-being and social engagement. The project will analyse Tir Coed's past and present vocational training and events to make them the best they can be for participants, groups, and communities in rural Wales in future. Since arriving in Aberystwyth in 2012, I’ve often used Aber’s fantastic woodlands and coastline to relax after days of essay-writing and exam revision, so the overlap between nature, mental health and well-being has long been an important part of my life. I’m enjoying the challenge of combining my research training in human geography with the day-to-day running of Tir Coed to bring both of my worlds together. It’s a long process, but I’m so excited to see where this research will go!